One summer, I was on wheat harvest with my dad in Pierre, SD. As we were driving, we passed a field of a questionable-looking crop so, being a little naive, I said bluntly, "Dad, what's wrong with their corn?" My dad explained that corn didn't have anything wrong with it because it really wasn't corn. He told me then about milo, or grain sorghum. Fast forward six years and I now live on a farm where we grow that "crappy corn" as I had once mistaken it. Since that summer, I have been a crop scout for sorghum, and I've learned there's a lot more to it than its weird appearance. I can also correctly identify seeds of a few different species of sorghum, both grain and forage (thank you crops judging). I've learned sorghum has a whole bunch of uses in the world. Oh, and I've learned this: all milo is sorghum, but not all sorghum is milo. Mind blown? I'll explain. Sorghum can come in a couple of types: forage or grain. Fairly obvious as it might seem, grain is grown and harvested for its actual grain it produces, while forage sorghum is grown to be used as silage, hay, or pasture for grazing. We actually grow both types on our farm, and we use our forage sorghum for hay for the cows and horses (they think it is quite tasty). 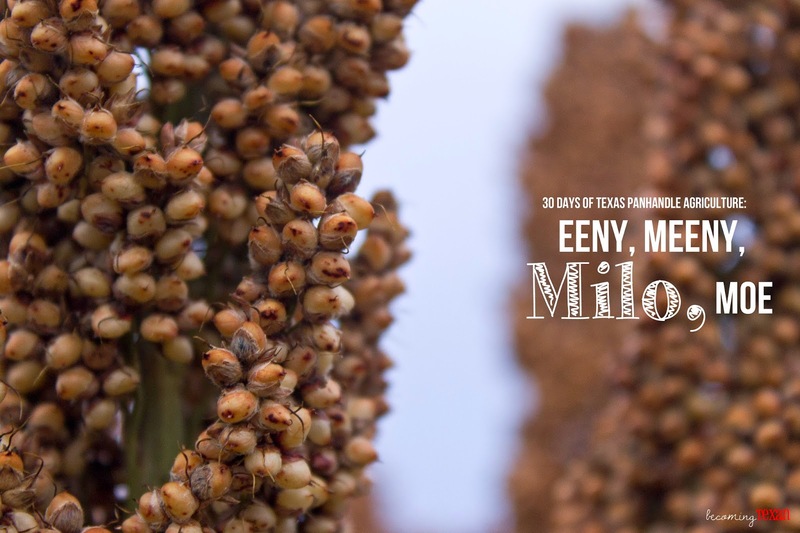 Milo is another name for grain sorghum because honestly, who wants to say three syllables when they can use two? Grain sorghum, grain sorghum, grain sorghum or Milo, milo, milo = My point precisely. Sorghum is a plant well adapted to dry, hot climates so, unlike corn, it handles the conditions of the Texas Panhandle very well without requiring irrigation. Unlike corn, we have options with sorghum. We can plant it on our dryland acres. We can plant it on irrigated acres with not-so-great water wells. We can plant it on irrigated acres with really good water wells. It really depends on the year and how we want to rotate our crops. Obviously, if we want a really high yield for our grain sorghum, we will plant it on the best irrigated acres. Sorghum also requires less fertilization generally than corn, making it less resource-intense than corn. Fun Texas Fact: Texas is actually the second-leading producer of sorghum in the United States, coming in behind Kansas in first position. What is sorghum used for? Well, like I mentioned above, forage sorghum is used for forages for livestock. Grain sorghum is used very similarly to corn and can also be used as a wheat substitute. Around one third of the U.S. production of grain sorghum is used for ethanol production. The other two thirds of the U.S. production are generally used for livestock feed. However, in Africa, grain sorghum is a very important human food product, and it ranks as the fifth most important cereal crop in the world. All in all, sorghum is a great crop for us to produce on the Texas Panhandle due to our need for sustainable feedstuffs for our beef population. It can be challenging, however, due to the hard-to-control cousins of sorghum known as johnsongrass and shattercane. Since those weeds are of the same species, they are nearly impossible to control with the herbicides available to us today. Tillage is another option, but johnsongrass reproduces through rhizomes so when we use tillage, we are really just spreading it around worse. One of our few options is to maintain a long rotational period between years of growing sorghum on a field, but that isn't always possible since we don't have many rotational options either. Oh, the woes of farming! Also, since sorghum is considered a "specialty" crop, research has been limited due to lack of private and public funding. I have no doubt researchers will consider sorghum's importance in the future, but I'm not sure how far away that future is from today. This is the sixth day of my 30 Days of Texas Panhandle Agriculture Series. To read more, please visit this introduction post. If you have questions or ideas about Texas Panhandle agriculture, I'd love to hear them! Question: where does the sorghum syrup come from? Like what I use in sorghum chocolate chip cookies or mixed with butter for your biscuits? Thanks for your question! From what I understand, via the National Sweet Sorghum Producers and Processors Association (http://nssppa.org/Sweet_Sorghum_FAQs.html), sorghum syrup is made from a few specific varieties of sorghum called "sweet sorghums." From my crops judging days, I believe those varieties are more related to what I would call forage varieties instead of grain sorghum. The syrup comes from extracted juices from the stalks of the sweet sorghum plants once the juice has been boiled down.